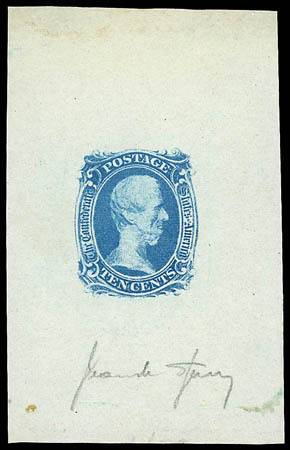 Confederacy, 1863, 10¢ blue, "T-E-N", Sperati Reproduction, Die Proof, on wove (42x67mm), signed Sperati in pencil, fresh and Very Fine. Scott No. 9R Estimate $300 - 400. 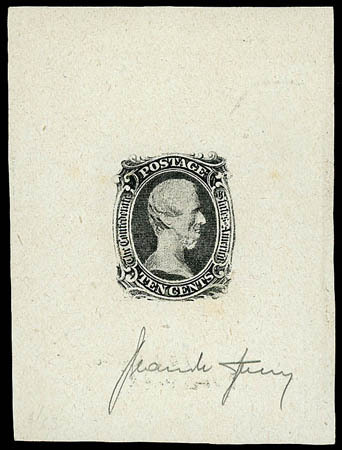 Confederacy, 1863, 10¢ black, "T-E-N", Sperati Reproduction, Trial Color Die Proof, on thin glazed card (50x67mm), signed Sperati in pencil and purple handstamp on reverse numbered "227", Very Fine. 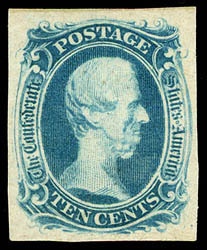 Confederacy, 1863, 10¢ blue, "T-E-N", Sperati Reproduction, gummed, ample to large margins, Very Fine. Scott No. 9R Estimate $150 - 200. Confederacy, 1863, 10¢ blue, "T-E-N", Sperati Reproduction, 3 singles, two used with Charleston, S.C. and New York town cancels, other unused, full to large margins, Very Fine; two with purple Sperati handstamp on reverse. Scott No. 9R Estimate $400 - 600. 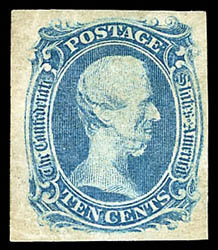 Confederacy, 1863, 10¢ blue, "T-E-N", o.g., lightly hinged, beautifully balanced margins, rich bright color and exceptionally fresh, Extremely Fine and choice, rare mint in such Post Office fresh condition; with 1995 P.F. certificate. 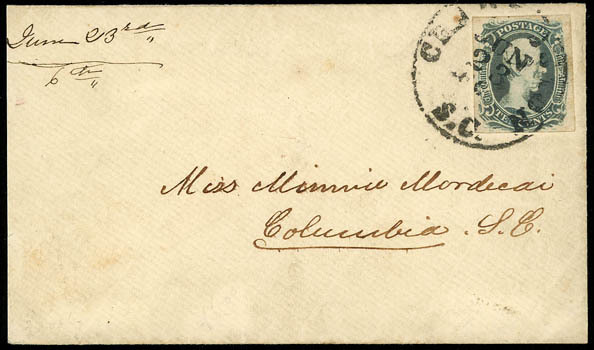 Confederacy, 1863, 10¢ blue, "T-E-N", clear to large margins, tied "Charleston, S.C., Jun 23" cds on neat commercially made envelope addressed to "Miss Minnie Mordecai, Columbia, S.C.", slightly reduced at left, Very Fine, ex-Cantey. Hon. Moses Cohen Mordecai - an importer of fruit, sugar, tobacco, and coffee - was Charleston's most prominent Jewish citizen in the decades before the Civil War. It was Mordecai's steamer, Isabel, which transferred U.S. Army Major Robert Anderson and his men from Fort Sumter to the Union fleet following the opening bombardment of the Civil War. Isabel, named for Mordecai's wife, gained fame for breaking through the Yankee blockade of the coast. In February 1865, after Sherman's troops left Columbia smoldering behind them, the city council appointed Mordecai "food administrator" to help feed the starving citizens. Blind and broken by the war, the reluctant secessionist moved to Baltimore, leaving his son-in-law Edgar Marks Lazarus in charge of his business affairs in South Carolina. 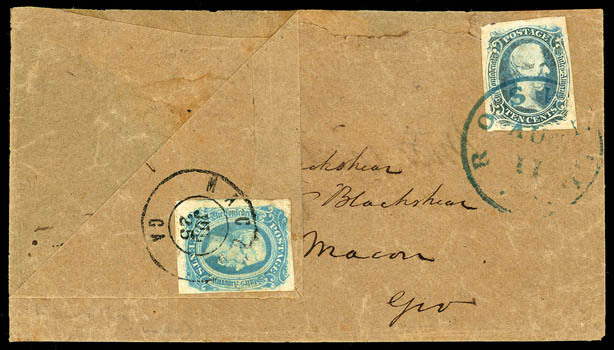 Confederacy, 1863, 10¢ blue, "T-E-N", four large margins, tied by blue "Roswell, Ga., Aug 11" cds on turned cover to Macon Ga., inside usage bearing 10¢ blue (12a), four margins, tied by "Macon, Jul 25" double-circle datestamp to Roswell Ga.; cover restoration along top edge, Very Fine. 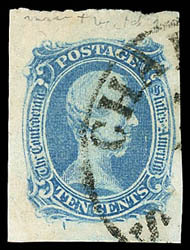 A CHOICE TURNED USAGE WITH A LOVELY "TEN" ISSUE AND 10¢ MILKY BLUE 1863-64 ISSUE. 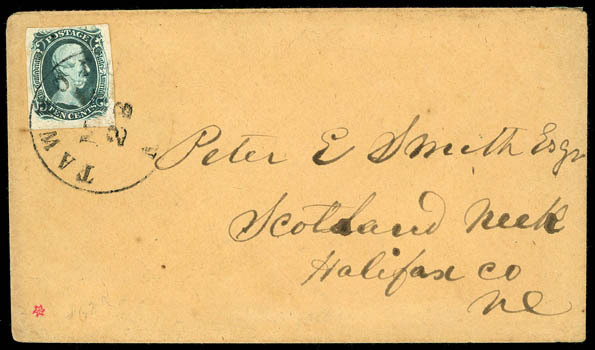 Confederacy, 1863, 10¢ blue, "T-E-N", curved lines outside labels broken, rich color, extra large margins except barely touched at top, tied by "Tawboro N.C., May 23" cds on buff cover to Scotland Neck N.C., Very Fine, ex-Knapp. Scott No. 9 var. 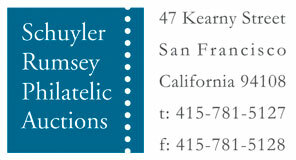 Estimate $750 - 1,000. 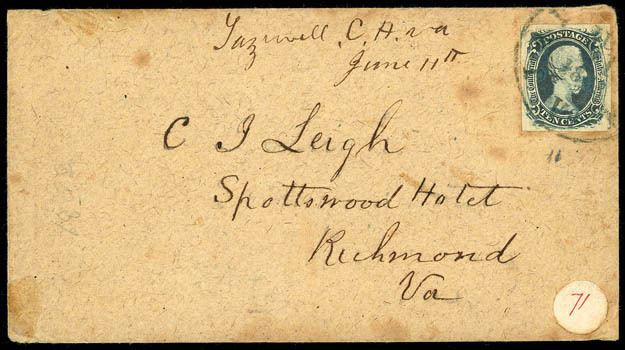 Confederacy, 1863, 10¢ blue, "T-E-N", ample margins and deep color, tied by "Tazwell C.H., Va., Jun 11" cds on homemade cover to Richmond, Va., manuscript docketing at top; few light cover tone spots, Very Fine. 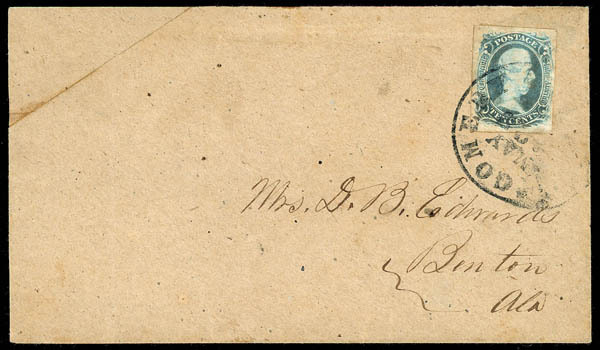 Confederacy, 1863, 10¢ blue, "T-E-N", large margins, tied by partial "Montgomery Ala., May 22" cds on homemade buff cover to Benton Ala.; stamp with light stain and minor surface abrasion at right, partial flap used to repair upper left, F.-V.F. appearance; with 2004 C.S.A. certificate.